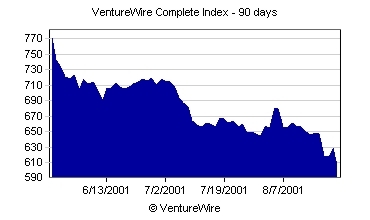 The VWIX continues to 'find its bottom'. Meanwhile, Venture Wire reports today: Private equity is proving too volatile a game for some investors and Goldman Sachs is hoping to find good deals as novices bail out. The firm has raised $1 billion to buy stakes in venture capital and other private equity partnerships on the secondary market. In a bellwether event, local company Storactive, on the brink for over a year, received a commitment recently for a new round from a major equity investment firm. Yes, valuation was adjusted and a new management team is coming in, but that this happened at all is astonishing. Several TechTransform projects are seeing renewed investment interest. The type of investor now appearing is an accredited value investor looking for a highly leveraged bridge investment. This is a good early indicator that a bottom is perceived in the market. I have seen a marked increase in quality deal flow in the last 60 days. In fact I plan on investing between 10 and 20 MM in deals on behalf of the other funds I advise within the next 30-45 days. This is a small bite for these funds, and puts them in even better shape if this is a "low", and really doesn't hurt them if it is not. Valuations remain around .33 of last year's. Do you agree? Let me know your thoughts by clicking on the email link below. Startups with compelling solutions in the storage and security arenas are getting funded. Both software and ASIC solutions in the storage sector are attracting investors. Wireless proposals continue to flood in, mostly applications and consumer ideas, but it is apparent that fundable wireless solutions with solid technical grounding and quality management are few and far between. We are starting to see a small resurgence in the commerce area, but have not participated in any deal to date. In Europe there is a definite sense that funding is still available for the right projects. Biotechnology and pharmaceuticals are the hot spots right now. Mobile communications technology still gets a respectable amount of funding but obviously last year's obsession with dot coms and marketplace plays is gone ! Keep your fingers crossed, we're getting close to a round of VC funding for our company. It's still a bit slow in high tech, but only in some areas. The smaller type of tools are selling like hotcakes. ...your 'take' on this is contrary to the assessment of most other news letters - Red Herring for example. Hope the contrarians prevail on this one. I have seen very similar trends with small Angel rounds or Bridge rounds. Additionally, I am seeing B rounds that are of better quality. I have not seen a huge increase in funding but they are happening. Hopefully, we will start to see a more dramatic move soon. Actually, there appears to be great interest in our company right now. We are talking with several different strategic and financial investors on different fronts. Thanks for the info and I have seen some favorable indicators as well. Things seem on a definite upswing. We are seeing better performance and that is the real key. If money's available, it's not filtering down to marketing. Our workload is off by 80% from this time last year, and the small to mid-sized companies we tend to work with are barely making it themselves. Whatever work does come in is strictly project-based, and the price sensitivity is more severe than an asthmatic in a smoke-filled room. I see some signs of optimism. We are seeing large companies funding IT projects for balance 2001 and 2002. It seems to me that Funding is coming back in the High tech area. Jobs for recruiters are also picking up. I do feel that it is still a slow process and it will take some time before it is back to normal. Yes, we're hanging in there until the climate improves and the market is more conducive to our selling our company to an appropriate partner. We are seeing that venture funding is stabilizing right now and we believe it will start to increase in the next few weeks. Yes, there are now more angel equity deals, and bridges for them. Lots still being done at valuations and terms that no institutional investor would touch. I agree that funding is coming back and things are looking a lot more interesting--VCs as well as angels though. I do agree that things have made a shift for the better. I'm not sure it is because the climate is much better, though. It may be that people have finally realized that business must go on regardless of what the landscape looks like. I think reality has settled in and people in the technology space now realize that sound business principles must still be applied in this area. Hype will no longer win the day. That being said, yes, more interesting things are happening. My company, for instance, has just closed a deal that will put some more $$ in the coffers over the next couple of years by licensing our technology. ...yes, I would agree that we are in the first days of the sector's recovery, funding-wise. And, I completely agree with 'forget the VCs for the moment.' So many people learned painful lessons about the real price of VC funding. Companies I am in contact with are pursuing small business loans (and of course, money from angels and friends) sooner than sell themselves to investors again. This is still a buyer's market. Our funding was a major down round, change of control, etc. etc. But I must say that I am happy with the outcome. Thank you for your recent note which I enjoyed reading. There is still funding available in Asia but as you would expect it's much more discriminating and, of course, valuations are a lot lower. I read somewhere it's as if all the tourists have finally gone home......................! But we think it's an excellent time to be making investments - on a selected basis of course. These days a VC has time to conduct due diligence properly, has more of a track record to assess while the investee can stretch the investor's dollar further through careful purchase of FAs (Fixed Assets), property leases and the available HR talent pool is broader and cheaper. Oh and I almost forgot to mention the most significant develoment - the VC's entry price.